We have different locations in Brentwood! Check to see where we are selling fruit today. Directions to 700 Creek Rd. 1. From 580. Take I 580 East towards Livermore. Exit Vasco Rd. North/Brentwood exit. Continue approximately 17 miles through the rolling Vasco Hills. Turn right on Walnut Blvd. approx.. 1 mile and turn left on Eureka Ave. Travel 1 mile. At the end of the road turn right, dip down across the bridge, turn right and go up the hill. Our packing shed is on the left. 2. From Antioch **NEW ROUTE**continue on State Highway 4 East towards Stockton. The freeway becomes a two lane road and you will turn LEFT at the stoplight on BALFOUR RD. Continue on Balfour for approx 2 miles and turn Right on WALNUT BLVD. Travel 1-2 miles on Walnut and turn RIGHT on Eureka Ave. Go 1 mile. At the end of the road turn right, dip down across the bridge, turn right and go up the hill. Our packing shed is on the left. 3. From Stockton take Highway 4 towards Brentwood. Turn left on Marsh Creek Rd. and continue west for 3 miles to the stoplight. Turn right on Walnut Blvd. Turn left on Eureka Ave. Travel 1 mile. At the end of the road turn right, dip down across the bridge, turn right and go up the hill. Our packing shed is on the left. Directions to 164 Payne Avenue. 1. From 580. Take I 580 East towards Livermore. Exit Vasco Rd. North/ Brentwood exit. Continue approximately 17 miles through the rolling Vasco Hills. Turn right on Walnut Blvd. approx.. 1 mile and turn left on Payne Ave. Travel 1/2 mile. Our fruit stand is on the left. 3. From Stockton take Highway 4 towards Brentwood. Turn left on Marsh Creek Rd. and continue west for 3 miles to the stoplight. Turn right on Walnut Blvd. Turn left on Payne Ave. Travel 1/2 mile. Our fruit stand is on the left. Directions to 600 Eureka Avenue. 1. From 580. Take I 580 East towards Livermore. Exit Vasco Rd. North/ Brentwood exit. Continue approximately Continue approximately 17 miles through the rolling Vasco Hills. Turn right on Walnut Blvd. approx.. 1 mile and turn left on Eureka Ave. Travel 1/2 mile. Our fruit stand is on the left. 2. From Antioch **NEW ROUTE**continue on State Highway 4 East. Using our new Bypass, continue on Hwy 4 and follow the "Bypass Rd" signs. The freeway becomes a two lane road and you will turn LEFT on BALFOUR RD. Continue on Balfour for approx 2 miles and turn Right on WALNUT BLVD. Travel 1-2 miles on Walnut and turn RIGHT on Eureka Ave. Travel 1/2 mile. Our fruit stand is on the left. 3. From Stockton take Highway 4 towards Brentwood. Turn left on Marsh Creek Rd. and continue west for 3 miles to the stoplight. Turn right on Walnut Blvd. Turn left on Eureka Ave. Travel 1/2 mile. Our fruit stand is on the left. 1. From 580. Take I 580 East towards Livermore. Exit Vasco Rd. North/Brentwood exit. Continue approximately 17 miles through the rolling Vasco Hills. Turn right on Walnut Blvd. approx.. 1 mile and turn left on Concord Ave. Travel 1 mile. Our fruit stand is on the right. 3. From Stockton take Highway 4 towards Brentwood. Turn left on Marsh Creek Rd. and continue west for 3 miles to the stoplight. Turn right on Walnut Blvd. Turn left on Concord Ave. Travel 1mile. Our fruit stand is on the right. 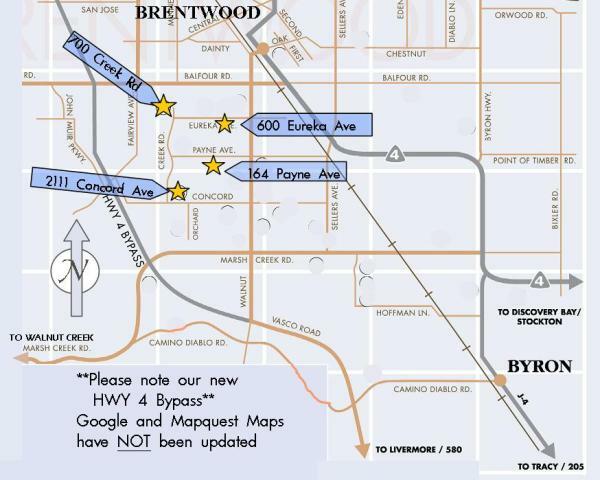 Bay Area Map to Brentwood. ** Note the new Hwy4 Bypass if traveling from Antioch!